Dental offices have lodged complaints to the ADA about explanation of benefit statements that are incorrect or need to be clarified, but the Association has resources available for dentists when dealing with third-party payers. The ADA has taken a strong position in advocating for clear EOBs, said Dr. Brett H. Kessler, a member of the ADA Council on Dental Benefit Programs. In at least one state, a legislator has decided to address problematic EOBs. Dr. Michelle Caldier is a dentist and state representative in the Washington state legislature, and is tackling the issue of what she sees as improper explanations of benefits from third-party payers. Despite the setbacks, Dr. Caldier said she would re-introduce the bill at the next legislative session, an action the Washington State Dental Association — included in the work group — supports. • Dental EOBs are not required to follow a standard format or standard definitions of terms. Information on EOBs can be confusing and can lead to misunderstanding. Some did not follow minimum requirements for the parties to do business in their name or follow other minimum disclosure standards. Some include misrepresentations about what the carrier paid, what the provider received and how the member’s cost share had been determined. Dr. Caldier’s experience underlines the fact that the language in EOBs can create confusion between patients and dentists. In an effort to get insurance companies and dental offices on the same page, the ADA has drafted a position on EOBs, available at Success.ADA.org/en/dental-benefits/ada-position-on-explanation-of-benefits. In it, the ADA urges dental benefit carriers to consider these principles, statements and recommendations as part of the EOB statements they submit to dental beneficiaries and dental offices. 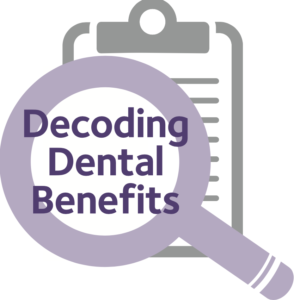 Staff from the Center for Dental Benefits, Coding and Quality can help dentists with dental benefits-related problems, questions and concerns. Call 1-800-621-8099 or email dentalbenefits@ada.org for questions.